Taiwan Makes Me Really Happy! 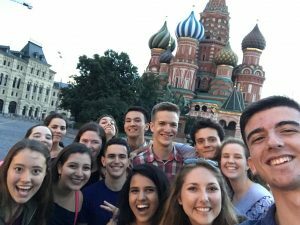 Kathryn participated in the 2017 Russian summer program. Russia has fascinated me ever since I was a young child. I remember coming home from my first day of second grade and being extremely eager to tell my parents about how I learned to say “Good-bye” (До свидания) in Russian. I always knew I wanted to learn this beautiful language, but I did not realize how much studying Russian in Moscow would impact my life. I had so many incredible academic and social experiences which definitely impacted my long-term outlook as an aspiring international student and future professional. One of the unexpected realizations during my trip to Moscow surfaced when we visited Russia’s main media source known as TASS. One of their senior journalists spoke to us about the organization’s history and mission. Afterwards, he offered us an opportunity to ask questions which was exciting yet, slightly intimidating. We had an honest and insightful conversation with him about U.S.-Russia media relations. His genuine insight allowed me to understand the complexity of our nations’ relationship and how it is often misunderstood. Additionally, Americans typically do not want to spend time reading multiple media sources, so they are at a disadvantage with the abbreviated soundbites from their preferred source. After returning home, several of my friends and family members asked me about cultural differences in Russia. Many still believe old stereotypes exist, such as inferior communication and infrastructure which no longer hold true today. Now, as a result of my unique immersion experience in Moscow with NSLI-Y, I feel qualified to provide an alternative point of view regarding these ongoing misunderstandings. With each passing day, our world news is requiring additional research from American citizens which can only help alter common cultural misconceptions about Russia. NSLI-Y Interactive showcases language learning and cross-cultural experiences of students on the National Security Language Initiative for Youth (NSLI-Y) program sponsored by the U.S. Department of State. 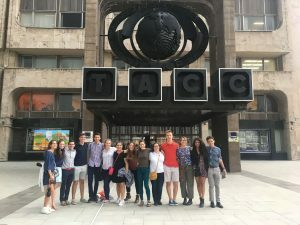 The multimedia stories on this site share the experiences of students on the NSLI-Y program with youth, educators, and language learners in the U.S. for further cultural exchange and language learning.